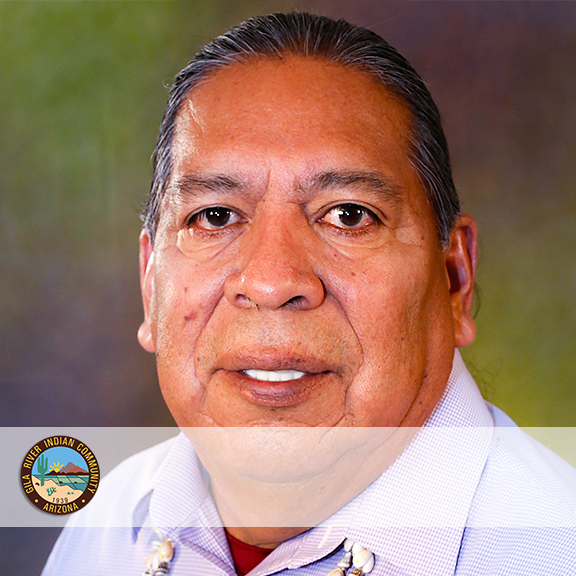 Lieutenant Governor Robert Stone, is from the village of Sweet Water located within the District #5 area of the Gila River Indian Community (GRIC). He attended Casa Grande Union High School and attained an Associate Degree in Agricultural Technology from Central Arizona College. After receiving his education he immediately began to continue to support his family and others in growing traditional O’otham crops, which he believes offers great value to his people’s lives, improves one’s diet, and should be part of GRIC’s agricultural endeavors. Mr. Stone’s business experience includes being the General Manager of Gila River Farms for a number of years. Since his time at the Farm, he has supported and is always willing to share his knowledge, experience, and education in sustaining and growing traditional crops, which are making a resurgence within our tribal Communities. Mr. Stone was selected to the Community Council for two terms, 2013-16 and re-elected in 2016. During his tenure as a member of the Community Council, he has served on an array of Community Council Standing Committees over the years, such as the Government and Management, Natural Resources, Economic Development, to name a few. He was a member of various special committees, including various engagements with local, state, and federal government departments. Mr. Stone brings a wealth of knowledge, insight, and historical perspective, as the Lieutenant Governor of the Gila River Indian Community. Mr. Stone is a fluent speaker of the O’otham language as his parents have always encouraged him to speak O’otham. As he was instructed by his elders, he strongly supports the teaching the O’otham language to the children, youth, and other Community members, including songs, traditional arts and the preservation of the significant O’otham history.